Super heroes are rarely idle, and that goes for our little Batman. 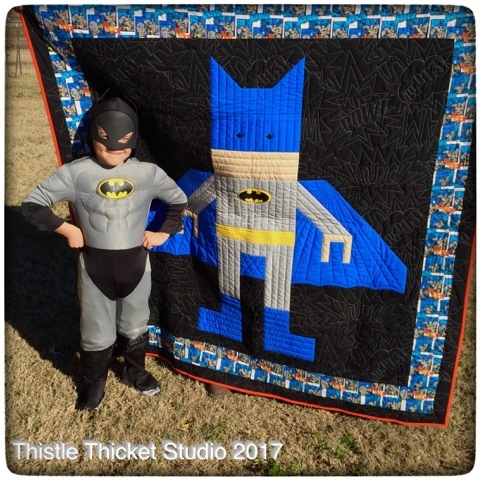 It took a day or two to track him down (he was out saving the world from the bad guys) and get him to stop long enough to pose with his Lego Batman quilt. But when he did, he posed in true super hero form. Only later, after he saw this photo did he realize that he forgot his yellow belt, so he ran into his play room to dig through his trunk of costumes to find it. 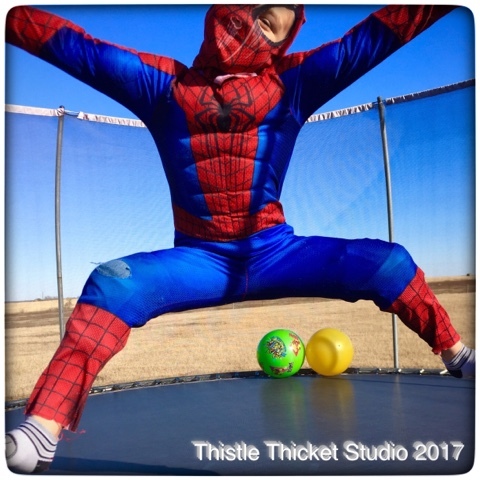 After a few minutes, Spiderman emerged from the play room and was off to cast his web over some bad guys on the trampoline. Never a slow day in the life of a super hero! 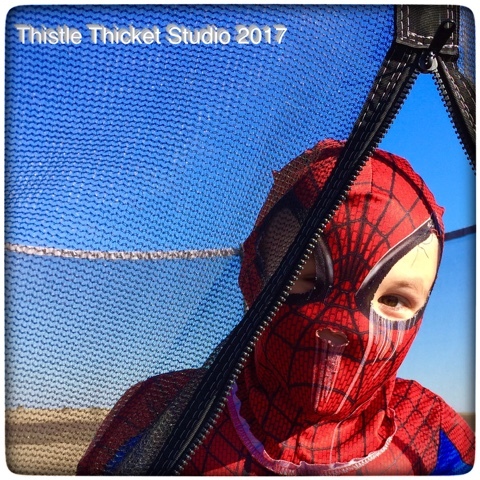 As you can see by the multiple holes in Spiderman's costume, my grandson loves his super heroes and lives in his costumes. 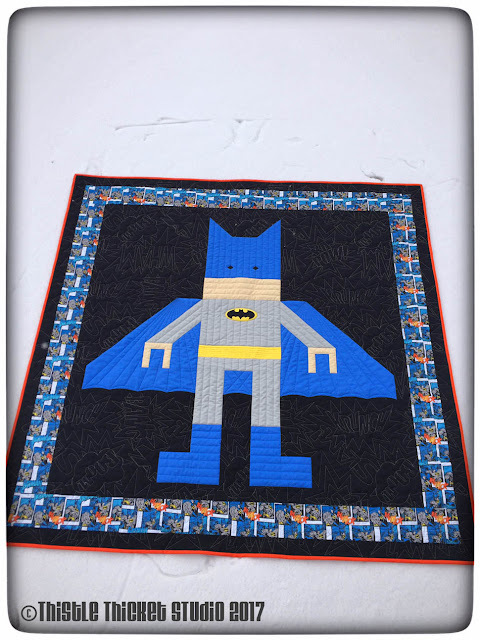 I hope his Lego Batman quilt gives him just as many hours of joy in the years to come. 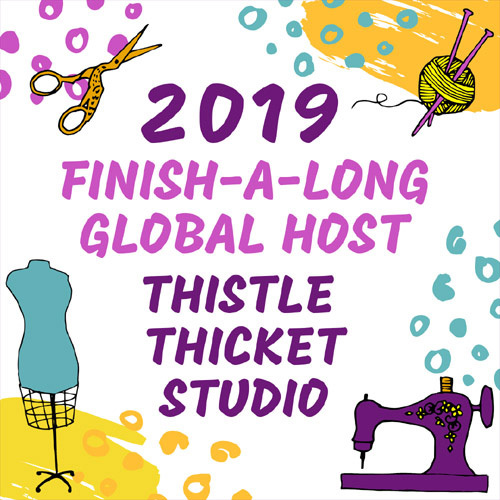 A new year brings a new challenge in our quilt guild. In recent years, a new year long challenge project is introduced at the beginning of the year. This year the challenge is a row quilt. 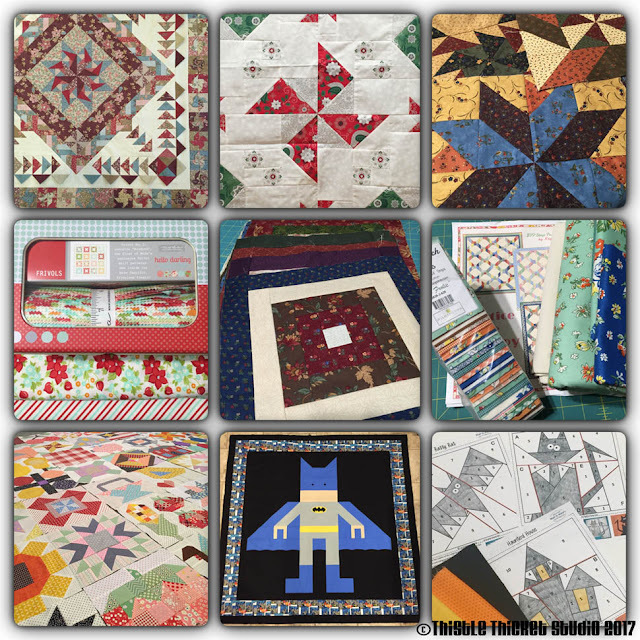 Each month, a new type of block will be drawn from 40+ possibilities and members are to make blocks for their row quilt. Size of blocks and size of quilt is up to each member, as is fabric selection. 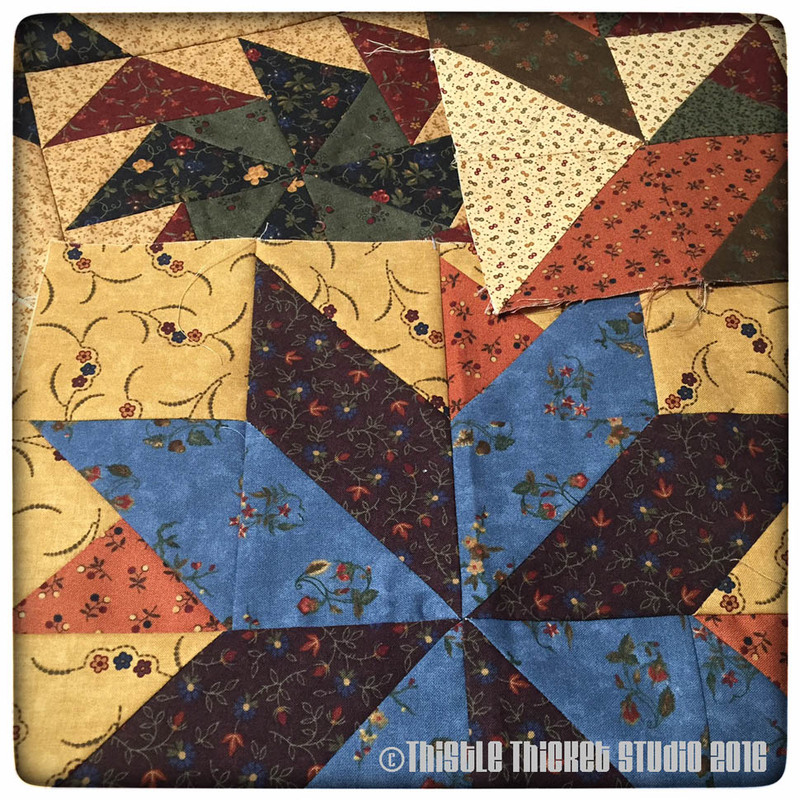 The first block type drawn for January was a 9-patch Medley. My interpretation of a medley of 9-patches was to make each 9-patch different. My personal challenge was to make them cohesive. To do that, I chose to make 4-patches in the corners of each block. But before I could make my blocks, I had to determine what size of quilt and what size of blocks to make. After some thought, I decided to make each of my rows 60" wide because a variety of block sizes (2", 3", 4", 5", 6", & 10") would all divide evenly into 60, giving me the greatest variety of sizes of blocks. For the 9-patch Medley, I chose to make 10 six inch blocks because it would evenly divide into 6, making each section of the 9-patch 2" finished. With all the math out of the way, I began sketching blocks on graph paper until I had 10 I liked. I've had a partial fat quarter bundle of Etchings by 3 Sisters for Moda and decided to use it for this challenge. 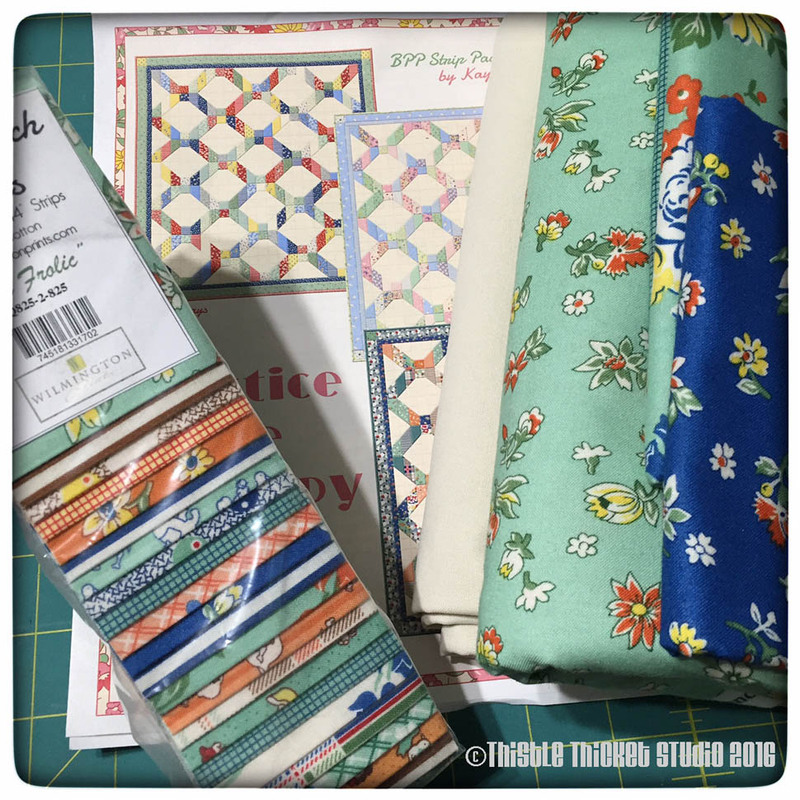 The bundle is partial because I stole all the red fat quarters for another project, so I had to search a little to find a suitable red. It is not from the Etchings collection, but I like how it fits in. 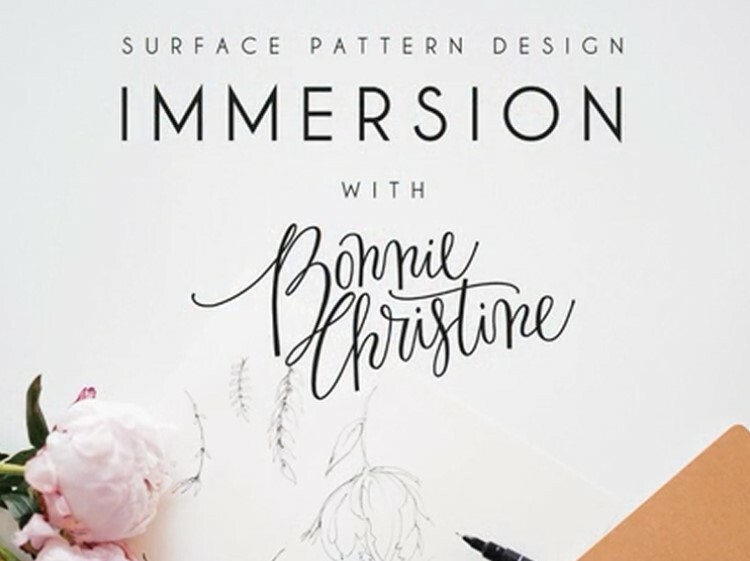 I did find an Etchings solid gray and will be using it to insert 1" sashings between the rows. 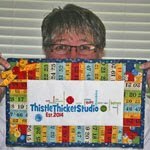 Since these quilts are a "challenge", I try to challenge myself to try a new approach or learn a new technique each month. But the biggest challenge for me on these projects is probably finishing them! Life seems to get in the way and I get behind, then pretty soon the project gets set aside and I'm off to a new project. The last two challenge quilts are still sitting in my sewing room, half done, and now on my list of 1st quarter goals for the Finish-A-Long. Here's hoping this row quilt challenge isn't destined for my list of goals for the 2018 Finish-A-Long! Na-na-na-na-na-na-na-na Batman! 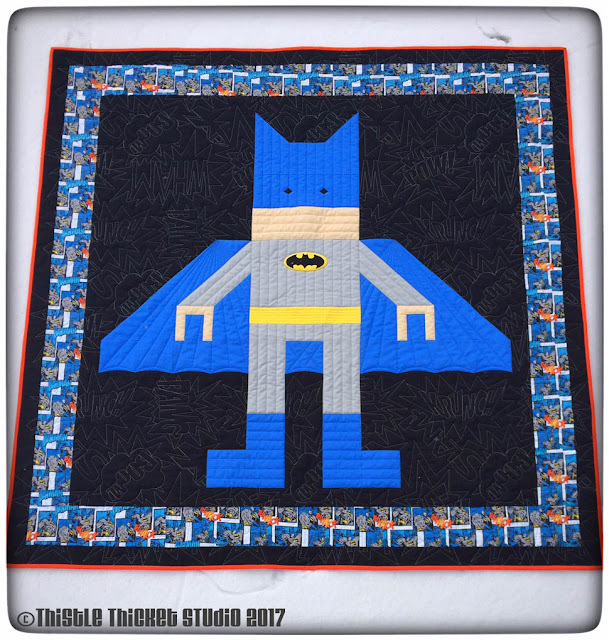 After a year of looking at my stack of Batman fabric, I finally designed, cut, sewed, quilted and bound the quilt in the last 12 days that my grandson requested last February. 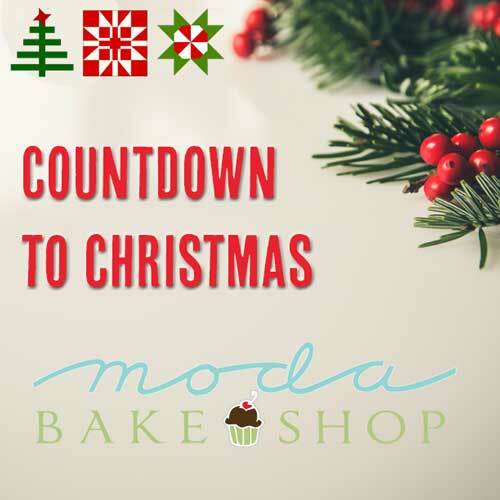 I can't wait to gift it to that superhero-loving five-year-old (the one that Nana and Papa scoured every sale rack last year after Halloween buying superhero costumes in every shape and form for dress-up costumes for his Christmas present). I'm not really sure why it took me so long to dig into this project because it went together really easy. I drafted my pattern on graph paper, then set about sewing the quilt top together in horizontal sections. 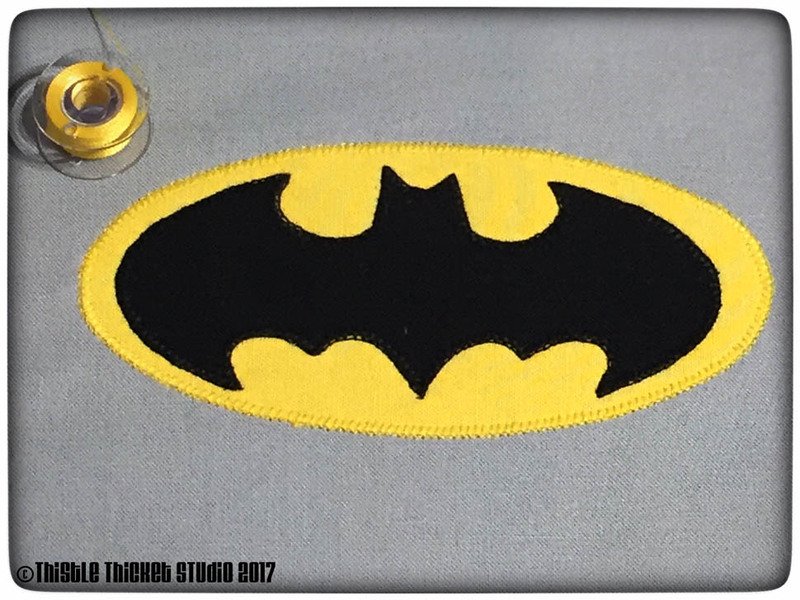 I raw edge machine appliqued the Batman logo on the chest block before sewing that section. 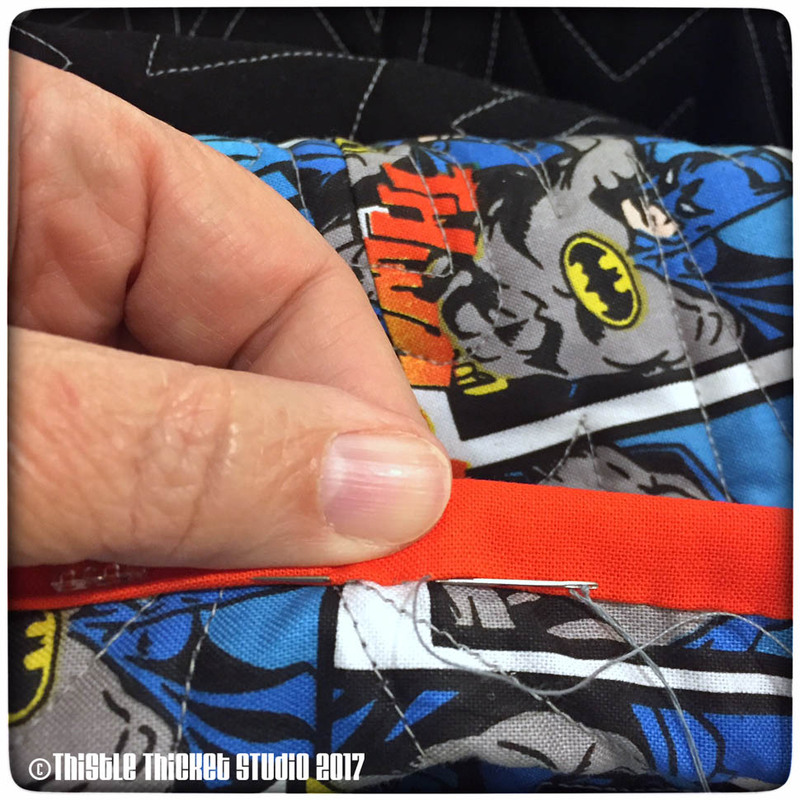 I thought the challenge on this quilt was going to be sewing the curved sections on the bottom of Batman's cape (I used Sew Kind of Wonderful's Quick Curve Ruler - easy peasy), but the real challenge came when trying to decide how to quilt it. I fell in love with this "KaPow-Slam-Wham" digital quilting pattern by It's A Quilt Thing but thought it would be too busy to quilt over the top of Batman, so I decided to quilt it as a background fill. 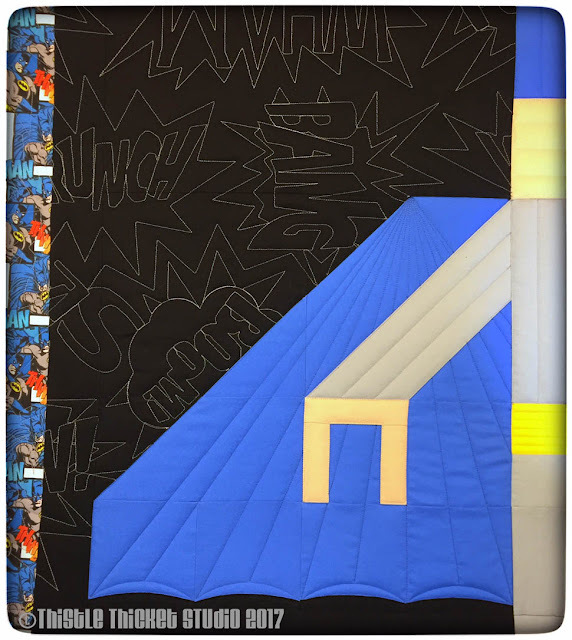 I quilted Batman using P2P lines which I thought would not distract the eye. Pow! A pop of orange for the binding really punched up the drama of the quilt. With the left over fabric, I made a matching travel-size pillow case with an inner pillow case in orange. I ran out this morning after finishing the binding for a quick photo in the snow. I'm hoping to get better photos later. And I can't wait to get a photo of the quilt with my little super hero in his Batman costume! 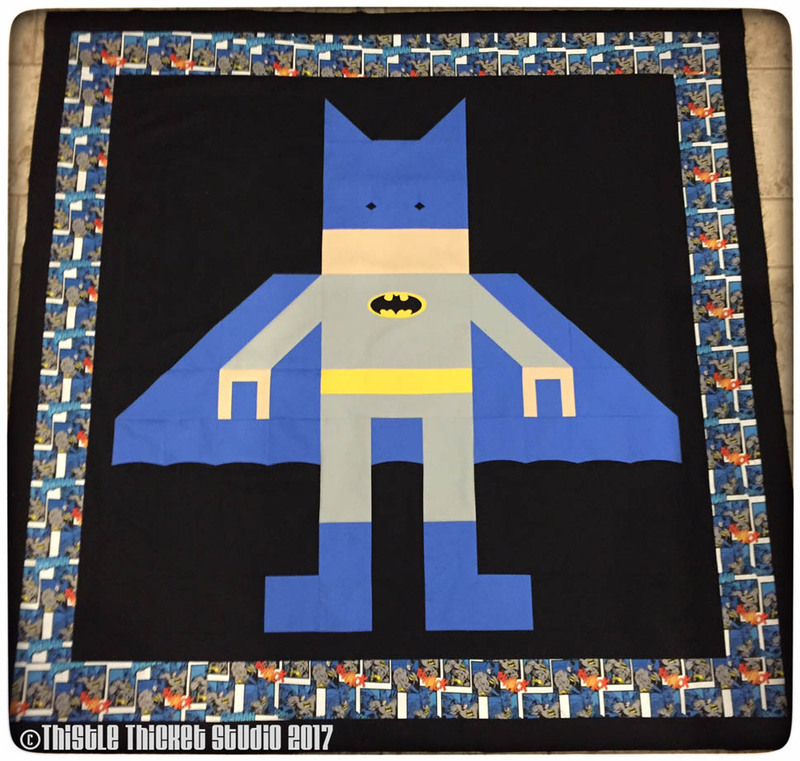 I would love to publish a pattern for this quilt and I'm currently researching the licensing issues on the licensed Batman character. Anyone with any knowledge or advice out there? Quilt Pattern: Lego Batman designed by me, aka Thistle Thicket Studio. 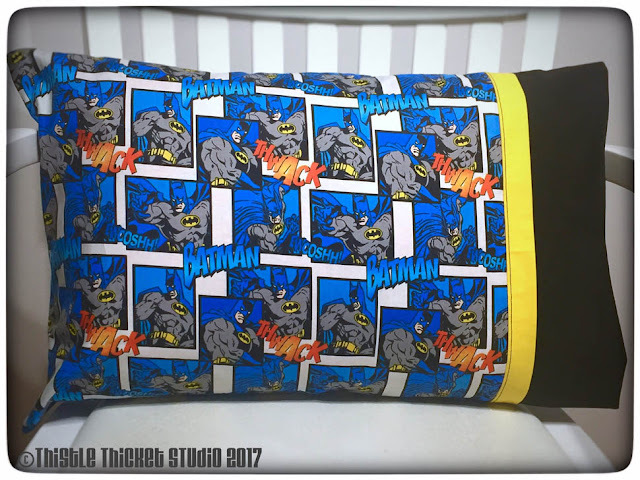 Fabric: #520211A, Batman: TM/MC & DC Comics, Eugene Textiles found at JoAnns. Kona Cotton solids (sorry I didn't record the exact colors). 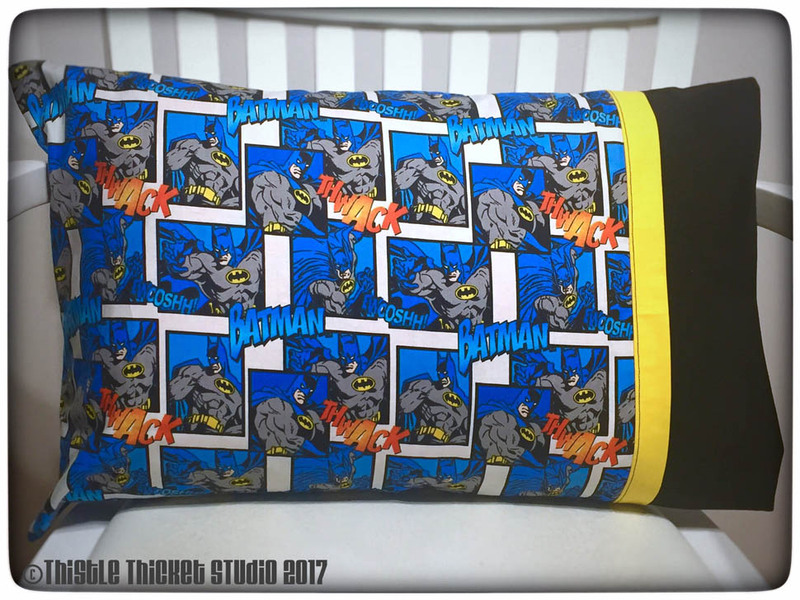 Backing: The same Batman fabric listed above. Binding: Kona Cotton in a shade of orange. Quilting: Quilted on a Gammill Statler longarm using P2P lines on Batman. 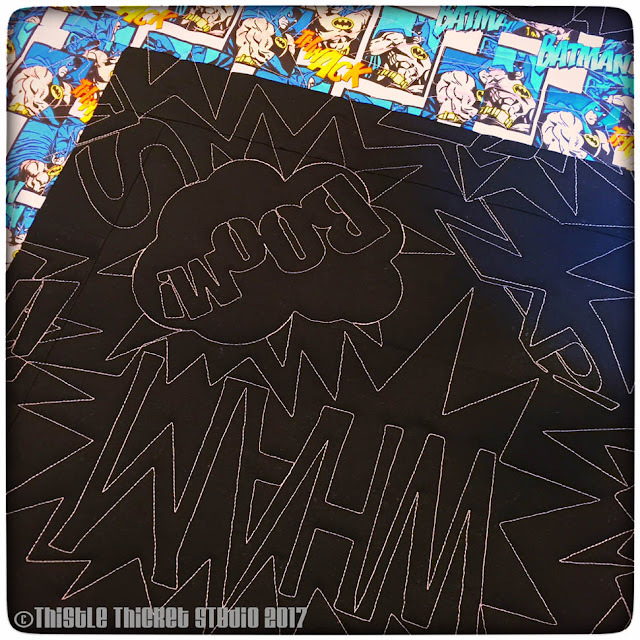 KaPow-Slam-Wham digital pattern by It's A Quilt Thing. Thread: Piecing thread was Aurifil 2730 50 wt. and Mettler 50 wt. in black. Quilting thread was Signature Solids in Buttercup, Ivory & Oyster Shell, and Aurifil 2730 50 wt. This is my first finish of 2017 and for the first quarter of the 2017 Finish-A-Long. So happy to mark this one of my to-do list! 1. Medallion Quilt Guild Challenge: This is last year's guild challenge. Unfortunately it hasn't been touched since mom's car accident, but I'm hoping and really need to get back to this soon. Our guild is going to have a quilt display at our local county fair the end of July with all the challenge quilts so I have a deadline. I'm always better with a deadline! 2. 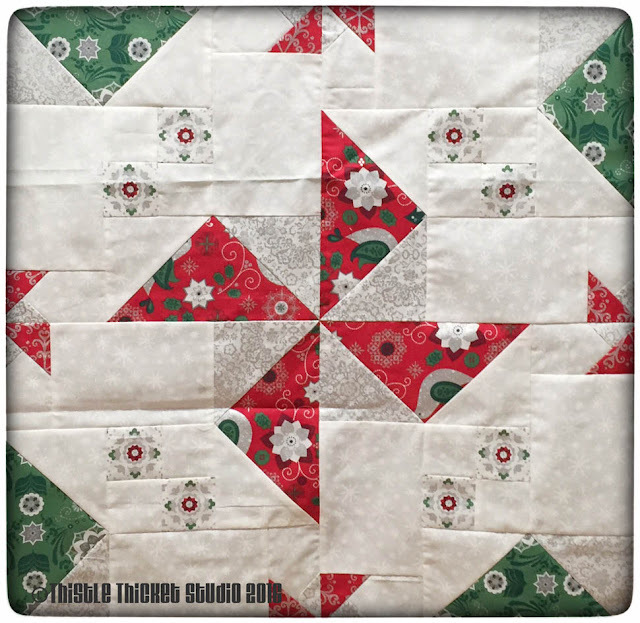 Christmas Table Runner: This table runner features the "Spinners" block I designed for Paintbrush Studio's New Block Blog Hop last year. 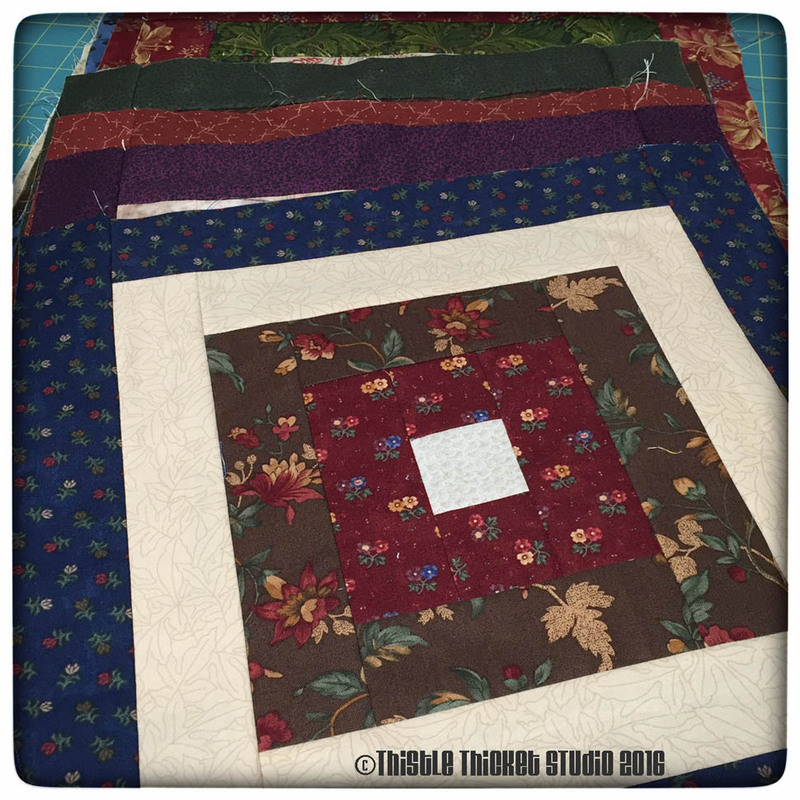 This one needs a backing pieced with the remaining fabric scraps and quilted. Easy right? Yay, right! 3. Quilt Guild BOM 2015: No that date isn't wrong. This one is a couple of years old now and I really need to get it done. I've figured out how I want to lay the blocks out now, which is progress. Unfortunately it will require making a bunch of star setting blocks. Ugh! 4. 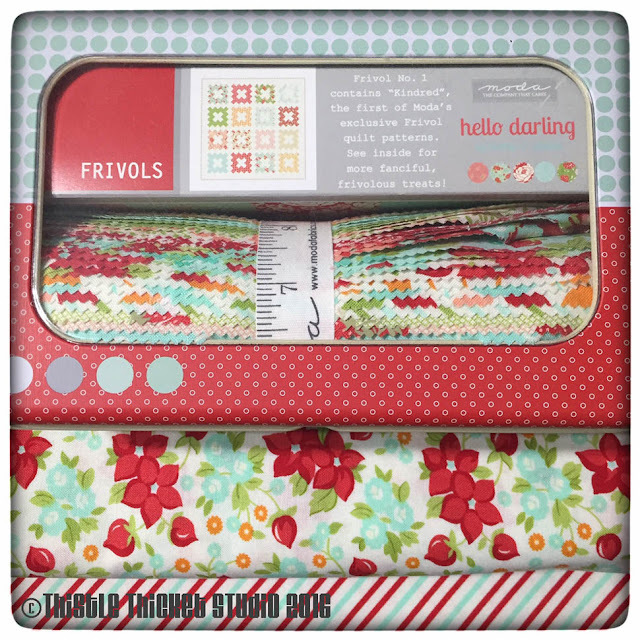 Hello Darling Frivols Quilt: I'm planning on taking this project to work on when we head south for a few weeks to warm up this winter. How much progress I make with it depends on how rainy it is in Texas while we're there. 5. 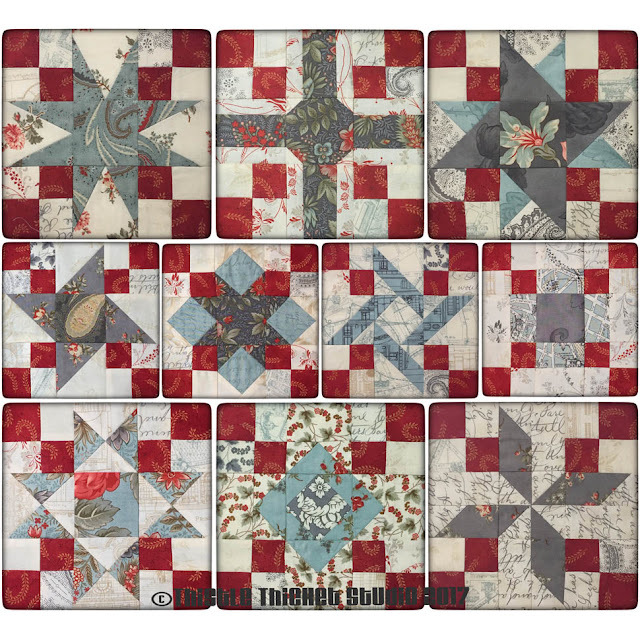 Leaders and Enders Project: I need to pull this one out and start using the leaders and enders method again to make the postage stamp blocks needed to complete this quilt. This is suppose to be my scrap busting project but it hasn't been busting any scraps lately. 6. 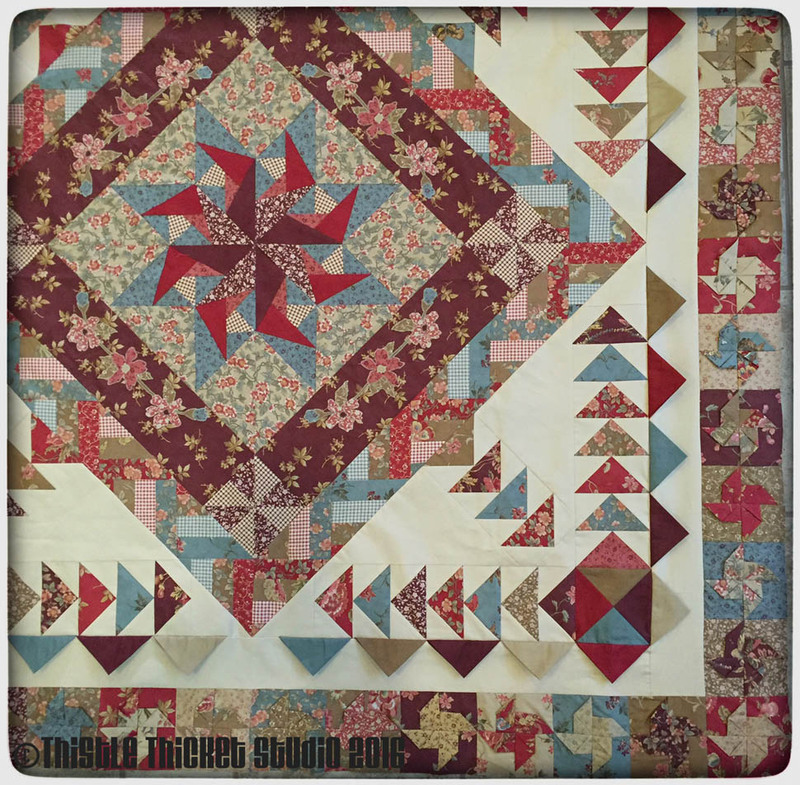 Fall Frolic Quilt: I just love this fabric and hope to dig into this kit soon. But realistically, it won't be until later this year. I'll leave it on the list - just in case (wink, wink). 7. 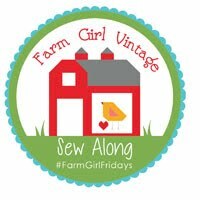 Farm Girl Vintage Quilt: Sadly, this one is still in the 'pile of blocks' stage. I have great plans for a really cool backing for this one, so I really need to get back to this one too. Hoping to at least get started on the back this quarter, although I doubt I get it finished either - but covering the all my bases. 8. Lego Batman Quilt: I can say I've made great progress on this quilt this week. The top is done and I loaded it on the long arm yesterday. 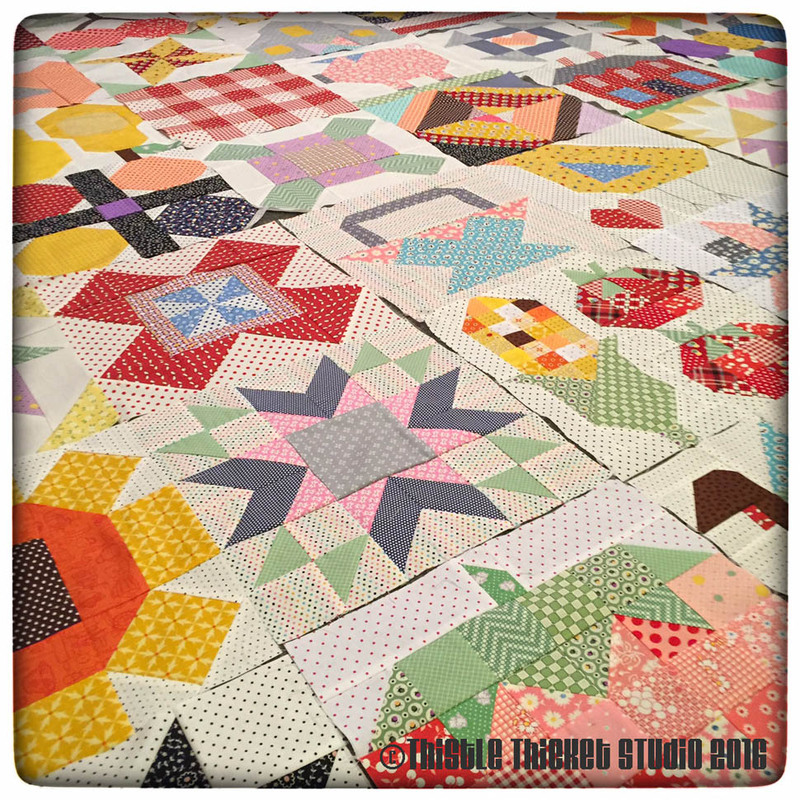 Hoping to get this one quilted and bound this week in time for quilt guild show & tell. It will be heading south with us and will be part of grandson #1's birthday present in February. 9. Halloween Mini Quilt: Speaking of quilt guild, we are having a sew day Saturday and I've been rummaging around trying to decide what I want to take. I hate dragging a bunch of sewing stuff for a few hours of sewing so I like to take small projects that don't require a lot of equipment. I discovered these paper piecing blocks that are free on Made by Marney's blog while sitting for hours each day with mom in the hospital. 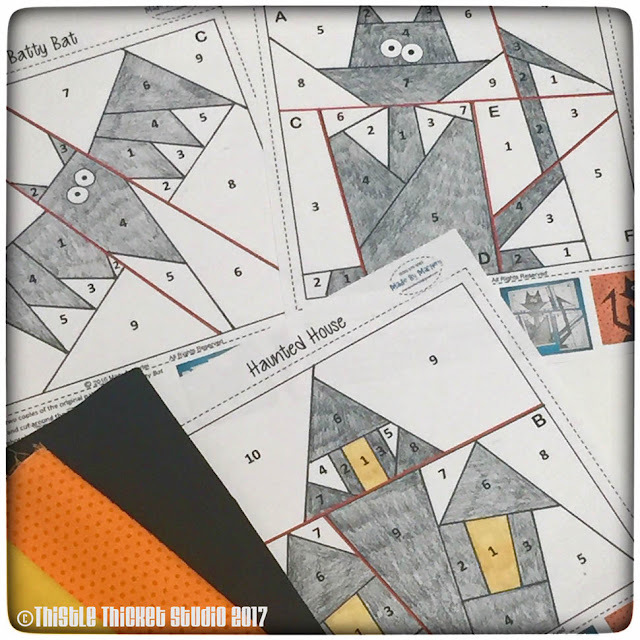 They will make a fun mini quilt - so cute! There you have it. My goals for the next three months. I've already set a precedence of only getting one or two things done each quarter, so I don't expect anything grand this quarter. But, at least I'm working towards some finishes and, as I said earlier, I work better with deadlines. I'll be linking up with the 2017 Finish-A-Long 1st quarter goals link-up. There's still time to join me in the fun and get some of your WIPs and UFOs completed, so go check it out! I just got home from spending the holidays with the kids and grandkids and couldn't wait to share my exciting news! 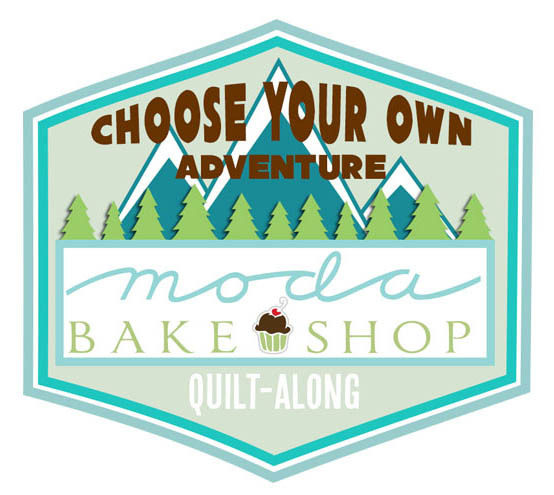 Yesterday, I stopped by Moda Bake Shop's blog and discovered their post "2016 Favorites" listing their top ten quilts for 2016. 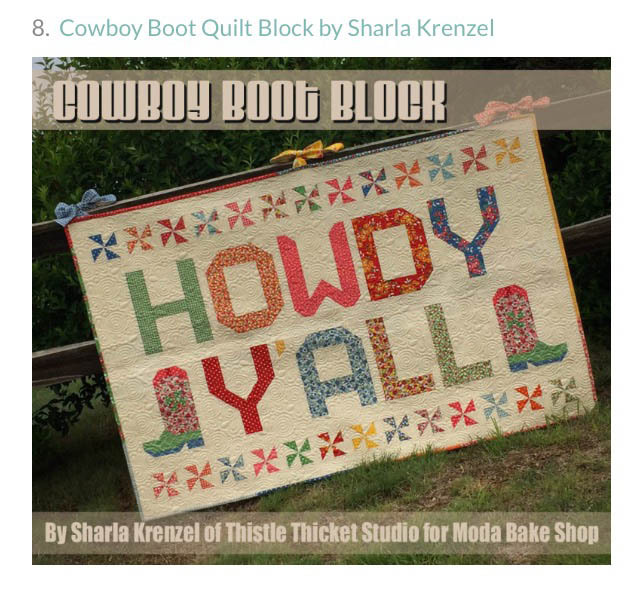 I was totally shocked and surprised - and THRILLED - that my quilt, "Howdy Y'all", made the top ten, coming in at #8. 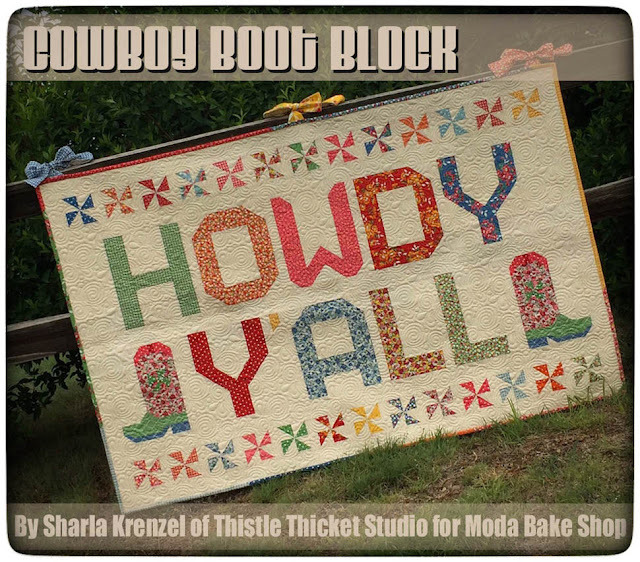 I'm not sure how the top ten were chosen - maybe by the number of visitors to the page - but in any case, I'd like to thank everyone who stopped by Moda Bake Shop to check out my Cowboy Boot Block recipe!